SinuCheck® / 40 softgels - Nature's Way®. Why choose a eucalyptus supplement? Powered by an herbal oil extract from eucalyptus. Take 2 softgels three times daily. Caution: Keep out of the reach of children. Do not exceed recommended dosage. If symptoms persist beyond 10 days or worsen, consult your healthcare professional. If pregnant, nursing or taking any medications, consult a healthcare professional before use. Soledum™ is a trademark of the KLOSTERFRAU Healthcare Group. 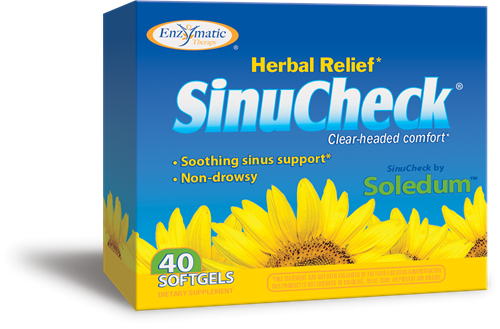 How is cineole, the key ingredient in SinuCheck ®, different than eucalyptus oil? SinuCheck ® provides a pure form of eucalyptus oil that has been clinically shown to support sinus and respiratory health. * The oil extract contains at least 95% cineole, the key compound in eucalyptus, in an enteric coated softgel capsule. Enteric coating ensures the capsule passes through the stomach unchanged and opens in the small intestine where cineole is effectively absorbed. Clinical research has shown that this purified extract is well tolerated when used as directed. In contrast, whole eucalyptus oil contains a number of different substances from a variety of eucalyptus species – some of which do not contain cineole. As such, eucalyptus oil and purified cineole will not have the same pharmacological and toxicological characteristics. While some medical resources urge caution when using eucalyptus oil internally as it can irritate the lining of gastric mucosa, this same caution is not warranted for enteric coated cineole supplements, such as SinuCheck ®. gelatin, medium chain triglycerides, vegetable glycerin, sorbitol, modified cellulose, sodium alginate, oleic acid, candelilla wax, and stearic acid.